Lyft Inc. became the first digital-hailing company in the world to list publicly, at the end of March. Lyft’s IPO is being closely watched by Uber Technologies Inc., which plans to list soon as well as other digital-hailing companies such as Didi Chuxing Inc., Yandex.Taxi BV, and Gett Inc., who are also considering public listings. So how does Lyft compare to its peers? Since its foundation in 2012, Lyft has raised $4.76 billion from private investors. This places Lyft fourth behind Didi, Uber and GrabTaxi Holdings Pte Ltd. (Grab) in raising private capital thus far. Lyft’s last fundraising round in June 2018 valued it at $15.1 billion. Lyft’s S-1/A filing values the company at between $17.6 billion and $19.6 billion; the valuation could rise to $23 billionshould restricted options be exercised. While the increased valuation would be profitable for Lyft’s existing investors, some like Rakuten Inc. and General Motors Co. are unlikely to sell most of their stake in the near future. Rakuten, one of Japan’s leading e-commerce platforms, is keen to integrate mobility into its existing services. Rakuten is also a major investor in Cabify (a digital-hailing operator in Europe and Latam), Careem Inc. (a digital-hailing operator in the Middle East) as well as GO-JEK Indonesia PT (a digital-hailing operator Southeast Asia). As Lyft continues to focus on North America, Rakuten can provide it with international partners. Investment from General Motors was done in parallel with agreement on a potential collaboration on the deployment of autonomous vehicles (AV). Lyft’s prospectus didn’t disclose the company’s cost to acquire a new user or a new driver or the churn rate of its drivers. All these factors are critical to Lyft’s profitability. Lyft’s prospectus shows revenue reached $2.2 billion in 2018 — 103 percent higher than 2017 — and its net loss totaled $911 million. While the net loss in 2018 was 32 percent wider than in 2017, revenue grew three times faster than the increase in losses, suggesting Lyft is making headway in managing its bottom line. Uber, Lyft’s main competitor, has been releasing its preliminary financial reports. For the first three quarters of 2018, Uber reported $8.2 billion of revenue and net income of $539 million. Uber’s higher revenue stems from its global footprint, while its positive net income reflects the sale of its Southeast Asia operations to Grab. Uber’s year-on-year revenue growth rate for the first three quarter of 2018 was 58 percent, below that of Lyft’s 103 percent for the full year. While Uber’s revenue growth rate appears to be lower than that of Lyft, it may have had more success in controlling its bottom line. Uber’s net loss of $1.07 billion in the third quarter of 2018 is 36 percent of revenue in that quarter, while Lyft’s net loss of $911 million in 2018 accounts for 42 percent of revenue in 2018. Of course, the comparison doesn’t cover the same period. Lyft states in its prospectus that it will remain focused on transportation — specifically services for moving people. Thus far, Lyft has expanded from ride-hailing/ride-sharing to micromobility via its acquisition of Motivate, a U.S. bike-sharing operator. It is also integrating access to public transit in its app. Lyft’s prospectus explains the high complexity of transportation as the primary reason to remain focused on this segment. 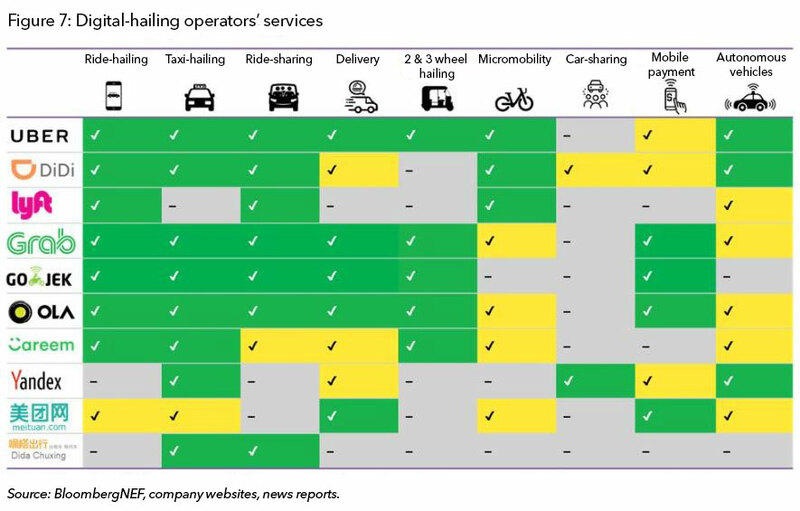 Most of Lyft’s peers have been expanding to other mobility (transportation of goods) and non-mobility services. Grab and Go-Jek, in particular, are at the forefront of developing super apps addressing consumers’ daily necessities for transportation, food, insurance, health and financial services. These companies are trying to utilize existing infrastructure as well as consumer data from their primary mobility services to launch new services such as e-payments and insurance. By creating a super app, these companies are trying to increase revenue as well as consumer loyalty. While such strategies offer routes to profitability via service cross-subsidization, it isn’t clear if super apps would be popular among consumers in North America, given higher levels of perceived privacy concerns. Given its geographical focus on North America, Lyft may be prudent to remain focused on transportation for now. Driver pay is the highest operating cost for all digital-hailing platforms. As a result, the bigger digital-hailing companies — Didi, Lyft, Uber and Yandex — have been actively pursuing development of autonomous vehicle (AV) technology. Lyft signed separate agreements with GM in 2016 and Ford in 2017 that included plans to collaborate on AVs. While neither of those agreements appear to have led to any notable AV deployments yet, Lyft’s collaboration with Aptiv launched at the 2018 CES has already led to more than 35,000 AV test rides. Lyft’s internal AV unit, Lyft Level 5, also continues its own R&D activity. Lyft’s internal AV activities appear to be smaller than that of Uber and Yandex, both of which have already been conducting their own public road AV testing. In its prospectus, Lyft has listed falling behind on AV technology development as one of its primary risks. Still, Lyft’s collaboration with Aptiv, which is part of the larger Intel-BMW led AV consortium, can act as an insurance policy, ensuring access to AV technology for Lyft. For Lyft (and Uber’s U.S. operation), there are increased policy risks as more local regulators consider measures similar to New York City’s cap on ride-hailing fleet size. California is also drafting rules to limit greenhouse gas emissions from ride-hailing fleets; both Lyft and Uber are already exploring ways to integrate electric vehicles into their fleets. Lyft’s prospectus lists a litany of risks under a remarkable yet succinct note of caution: “We have a history of net losses and we may not be able to achieve or maintain profitability in the future.” While the risks listed in Lyft’s prospectus may seem alarming, all those risks also apply to other digital-hailing companies. Digital-hailing services are still unprofitable today and face significant challenges to become profitable. However, more and more consumers are relying on such services. And the importance of digital-hailing services will continue to grow as the world tries to move towards more efficient modes of transportation while maintaining consumer convenience.